Miriam J. Manber is a trial lawyer with experience litigating commercial contract, employment, and civil rights matters. She handles cases at all stages of litigation, and has won numerous favorable outcomes for her clients, large and small, including multiple victories on motions to dismiss and summary judgment, in jury and bench trials, and on appeal. Notably, Miriam has the in-depth knowledge and experience required to handle voluminous e-discovery projects using the latest technology. She regularly defends public agencies, including railroads, in employment discrimination, construction, civil rights, and other matters, including claims under the Federal Employers Liability Act and the Federal Railway Safety Act. 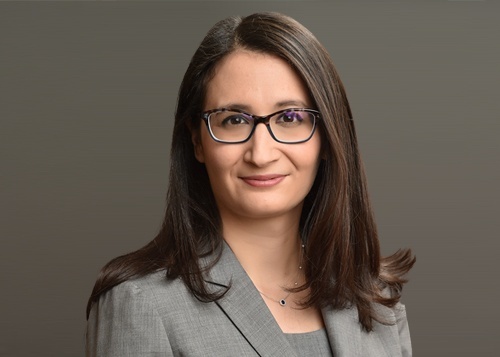 Prior to joining Hoguet Newman Regal & Kenney in 2015, Miriam completed a two-year clerkship in the Staff Attorney’s Office of the U.S. Court of Appeals for the Second Circuit. While in law school, she participated in Cardozo’s Alexander Fellows Program, which allowed her to spend a full semester interning for the Honorable Laura Taylor Swain of the Southern District of New York. ­ Obtained a multimillion-dollar jury verdict on behalf of a foreign credit card issuer and acquirer pursuing breach of contract and conversion claims against a major credit card scheme. ­ Obtained a bench trial verdict on behalf of a public agency, defeating a Federal Employers Liability Act claim. ­ Obtained pre-discovery dismissal of breach of contract claims on behalf of a small business client in the energy industry. ­ Obtained summary judgment in favor of two public agencies named as co-defendants by two plaintiffs bringing race-based employment discrimination claims. ­Obtained a favorable negotiated settlement on behalf of a public agency in a civil rights class action alleging that certain agency procedures violated the Americans with Disabilities Act. ­Obtained summary judgment dismissing Family and Medical Leave Act discrimination claims on behalf of a public agency, which was affirmed on appeal. ­Obtained a rare defense win on summary judgment on behalf of a public railroad against Federal Railroad Safety Act whistleblower claims. ­Ongoing defense of a public agency in an action by a retail tenant alleging breach of commercial lease terms. ­Ongoing defense of a public agency in an action seeking delay damages in a multimillion-dollar public construction contract. ­Ongoing defense of a public agency in a civil rights class action alleging that certain facilities are inaccessible in violation of the Americans with Disabilities Act. Intern for the Honorable Laura Taylor Swain, S.D.N.Y.